Wales has often been described as “The Castle Capital of the World”, with an abundance of magnificent castles to be found in the North Wales region, each having its own tale to tell, to defend against the enemies; to show off the treasures of the monarchy or for trade reasons. The numerous Static Caravan parks in North Wales provide reasonably priced accommodation for castle lovers to base themselves and set out on an exploration of Welsh heritage. One of the nearest castles to Sirior Bach Caravan Park is to be found at Conwy, overlooking the estuary. 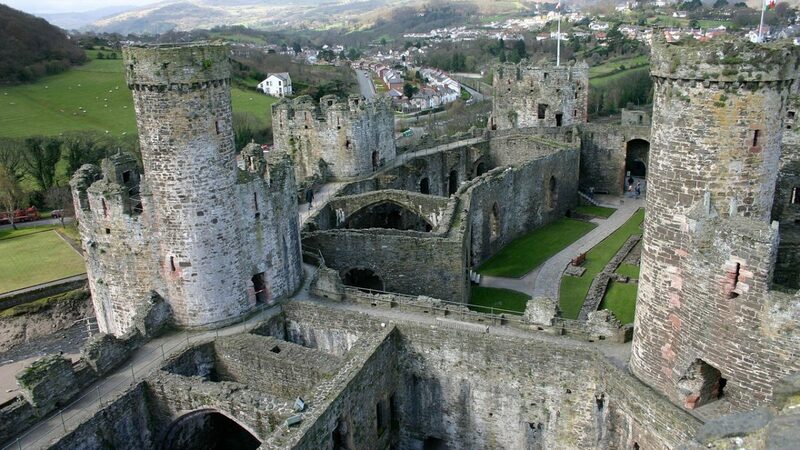 With its amazing eight towers built to form a rectangle and medieval walled town, it was built around the 13th Century by King Edward I to provide an iron ring of fortification around Snowdonia. The castle was built in only 4 years using around 1500 craftsmen from all over England. Conwy castle has been listed as a World Heritage Listed site. Although now in ruins the castle, formerly built here by Henry III, has remains of the gatehouse towers, bailey banks and ditches and Edward I’s curtain wall. It is rumoured that Edward took the ruinous stones from here to construct his castle fortress in Conwy. One of the most impressive, architectural castles in North Wales, this castle was built as a seat of power. Constructed on the shoreline, most of the supplies were brought in by sea. Previously the location of a Norman motte, a Bailey castle and also a Roman fort Caernarvon Castle is unusual because it was built not with round towers but with polygonal towers, the most magnificent being the Eagle Tower. In 1969 this was also the location of the investiture of the current HRH Prince Charles of Wales. If you visit this castle, make sure you also see the two towers that house the Museum of the Royal Welsh Fusiliers. Caernarvon Castle also has the accolade of World Heritage listing. This fine castle is set in 260 acres of grounds and is open to the public almost every day of the year. With mulberry trees that are thought to be 500 years old, the impressive grounds and gardens are worthy of a visit. After undergoing a near 6 million pound re-development to restore it back to its Victorian splendour, the castle now houses the National Portrait Gallery’s Victorian collection. Here you can view changing exhibitions throughout the year with interactive galleries, and activities and trails for the children. Situated between Snowdonia and the Menai Strait, this historic monument was built by Thomas Hopper between 1820 and 1845 for the Pennant family whose wealth was accrued from quarried local slate and their sugar plantations in Jamaica. The castle is neo-Norman and contains enchanting “Norman” style furniture, almost a “fantasy” type castle. One of the famous features is a huge slate bed believed to weigh one ton, made for Queen Victoria. No matter which fortress you choose to visit, you can ensure a trip back in time where royalty, romance and war have all been a part of the rich history of castles in North Wales. Sirior Bach Caravan Park is one of the more exclusive static caravan parks with some of the best Holiday Lodges for sale in North Wales that you are ever likely to find. A rural retreat nestled in the countryside, with spectacular scenery in every direction; there are few places in the UK that provide such peace and tranquillity.